‘inception chair’ is a seating concept which draws on the archetype of the chair nestling it within a progressively smaller form of itself to create the actual seat. 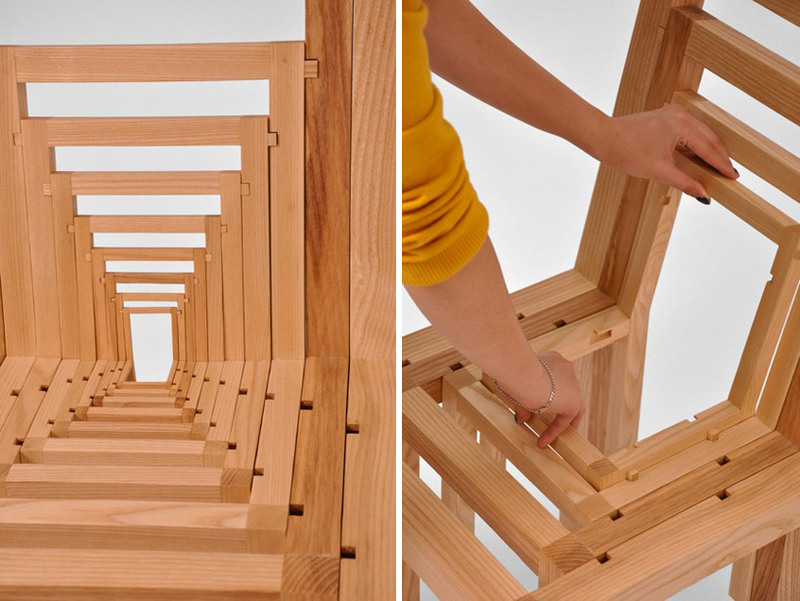 developed by RISD furniture student vivian chiu, the design consists of 10 chair frames that fit into one another via hand-cut grooves which are cut out of the inner edges of the frames’ seats and backs. pegs on the outer end of each frame fit into the notches of the previous sized chair, sliding easily in place so that the horizontal edge between chair seat and back line up. I like this crazy project! i was going to say, waste of materials and effort… but on second thoughts, so what; it’s just lovely, especially the family group. the form is pure, even though it’s seem to use more materials than normal one. i think it waste less wood when it’s making up because its pure. I would buy one of these things in a heartbeat, if just to have the conversation piece. I wonder if this would have the same effect in a different setting. I have a feeling the illusion is only this effective with a consistant, blank background. the effect caused by this chair is amazing.